Defunct Nuclear Power Plant On California Coast Is A "Fukushima Waiting To Happen"
A nuclear power plant in Southern California that was shut down in 2012 continues to leak radioactive material and poses a threat to nearby communities. 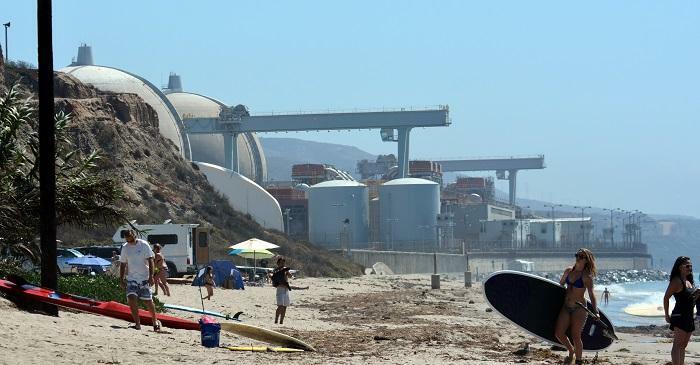 The aging San Onofre, located in San Clemente, CA, was shut down in 2012 amid a leak that occurred due to malpractice. According to a report released in 2016, the plant “operated the reactor outside the allowable limits for pressure and temperature, causing the radiation leak that shut down the facility for good,” the San Diego Tribune noted. The shutdown also launched extensive investigations that implicated both the power company and state regulators. “On 3 August 2018, a 100-ton canister filled with highly radioactive nuclear waste was being ‘downloaded’ into a temporary transport carrier to be moved a few hundred yards from inside the plant to a storage silo buried near the world-famous San Onofre beach. As the thin-walled canister was being lowered into the transport cask, it snagged on a guide ledge four feet from the top. Crane operators were unaware that the canister had stopped descending and the rigging went completely slack, leaving the full weight of the heavy canister perched on that ledge by about a quarter-inch. Each canister reportedly has as much radiation as was released during the infamous Chernobyl nuclear disaster. Further, San Onofre is located directly on an earthquake fault line in an area with a record of tsunamis. San Juan Capistrano Councilwoman Pam Patterson told President Trump at a roundtable discussion in May that San Onofre is a “Fukushima waiting to happen.” She also expressed concern that the facility, which is a no-fly zone but secured mainly by armed guards, could be a target of a terror attack, noting that terrorists targeted nuclear power plants in addition to the World Trade Center and Pentagon. Any time of disaster would have far-reaching effects. Shortly after the plant shut down, former prime minister of Japan, Naoto Kan testified in San Diego, noting that during the Fukushima meltdown, he was prepared to evacuate not just Tokyo, but regions as far as 160 miles from the plant. Downtown Los Angeles is only 62 miles away from San Onofre and 50 miles from San Diego. Worse, there are no state or federal evacuation plans in the event of a catastrophe. Chappelle says that while solutions include moving the waste to a location 80 feet higher than the current plant, which is by the beach, or “maintain a cooling pool on site for emergency transfer efforts in the event of a cracked canister or terrorist attack,” these are all short-term solutions. As of last year, Edison was working on a plan to bury the nuclear waste, but Chapple believes the only way to truly resolve the problem is for Edison to develop storage technology that is not prone to severe leaks. Though Edison has started that process, earlier this year San Onofre officials found a defect in the design created by Holtec, a contractor whose workers were responsible for the accident earlier this month.